the summer edition of vintage mart coming up this weekend, and i'm bringing in several rolling racks FULL of amazing vintage clothing. i've got some vintage items from canadian designers like wayne clark and joseph ribkoff. my favourites are a pair of amazing leather riding boots in mint condition, a floor length pierre cardin velvet dress, grey suede & black leather skirt, black cross front dress with beaded shoulders, a ton of really unique blazers, etc... come see! 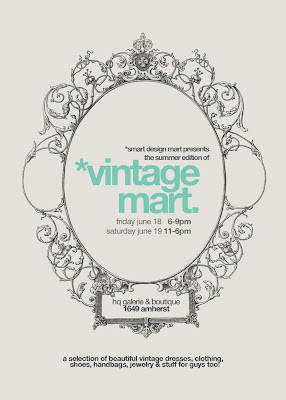 here's the vintage mart summer edition facebook event and visit smart design mart blog (my other blog) for previews of what's going to be at the vintage mart. 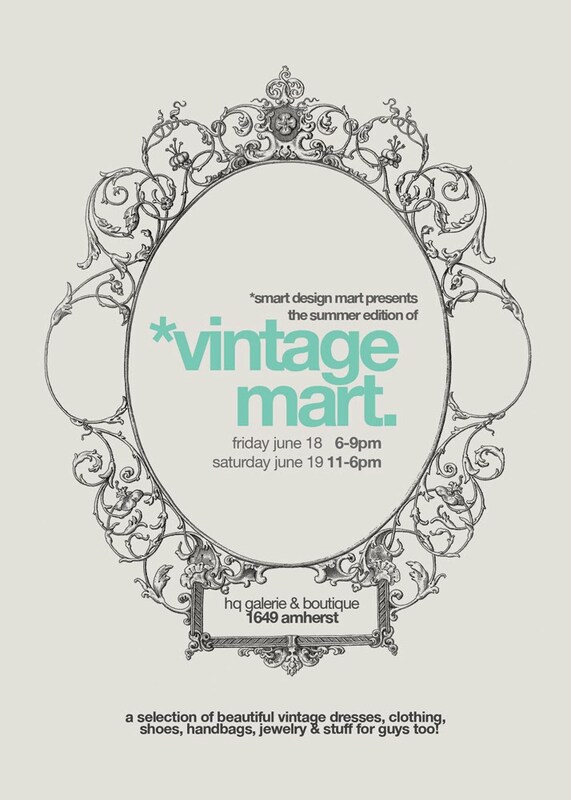 so this summer edition of vintage mart is brought to you by the smart design mart team (i'm part of that team) as well as the following lovers of vintage. we wear it, our homes are filled with it, we're obsessed with it and we're sharing our handpicked finds this friday 6-9pm and saturday 11-6pm at headquarters gallerie + boutique. when we're not hunting down vintage goodies, we're drawing, sewing, making jewelry, making clocks, and running a store. have a look at what we do!